I should of mentioned that palette I showed you the other day was named ‘Dark Red with a Yell’. I showed you the canes I made, here’s some of the jewellery I made from them and the colours in this palette. 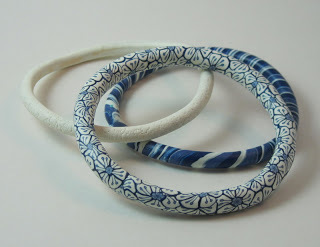 Another bracelet like my purple crinkle one, with matching earrings. The spacers were smaller beads so I needed a lot more discs, must remember that next time and find larger beads! I put some of the spacer beads on the jump rings for the earrings, not sure about them – what do you think? Changing the yellow for a darker one and adding a cream gave me this lovely flower! 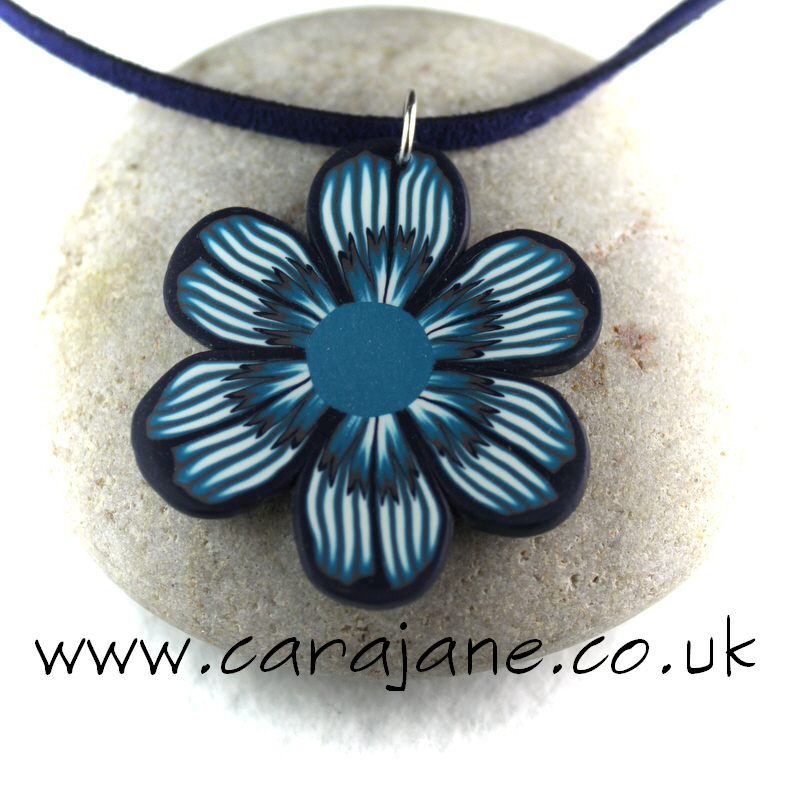 (Based on the tutorial from Ayelet but I have made a few changes as always) Pictures shown are the front and back of the same flower pendant, I like to add a different colour centre to the two different sides as it really changes the look. 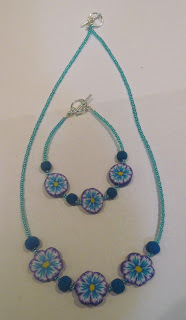 I have another more complicated beaded necklace sat in bits on my workbench, I show you when it’s finished. These will all be for sale at my next show which is Totterdown Arts Trail, don’t forget to check my diary page to see what else I am up to. Maybe I will find time to set up an online shop before then too. Now I am off to make 40 inchies for a swap as part of The Polymer Clay Event I am very much looking forward to attending in Alfreton,Near Nottingham, UK in just 3 weeks! Hopefully I will see some of you there! Grey, blue and teal jewellery Latest jewellery – and it’s all for me! Christmas Fair Dates and NEW CREATURES! Exhibition excitement!!! The flower is really pretty. Love the colours. Love these colors, Cara…beautiful cane work! I love the pendant, specially the last stripes composition, the effect is so…painting like and contrasting with the well defined shapes of the extruded canes. You should play more with that effect. Diana you did the hard work inventing the palette, I just played with it. I couldn’t quite decide if the stripes worked as they weren’t straight and rigid, being made of swirled up scraps passed through the pasta machine but I like to think you are right and the contrast works.